Our trip started with the Bangalore darshan by Sugama Tourist. We boarded the bus at 730pm and after showing us almost half of Bangalore we passed Nelamangala at around 1030pm. The bus stopped for dinner at Kamat Upchar just before Tumkur at around midnight. We reached Gokarna at 9am. You will have to get down at Maruthi Katte. This is the last stop and also the alighting point when going back. We had checked online for rooms but all the places that offered booking were in the city and not by the beach. So we had taken the risk of not booking the rooms. Om beach is the popular beach in Gokarna but most blogs suggested that we need to stay in Kudle beach. So we took an auto to Kudle beach. 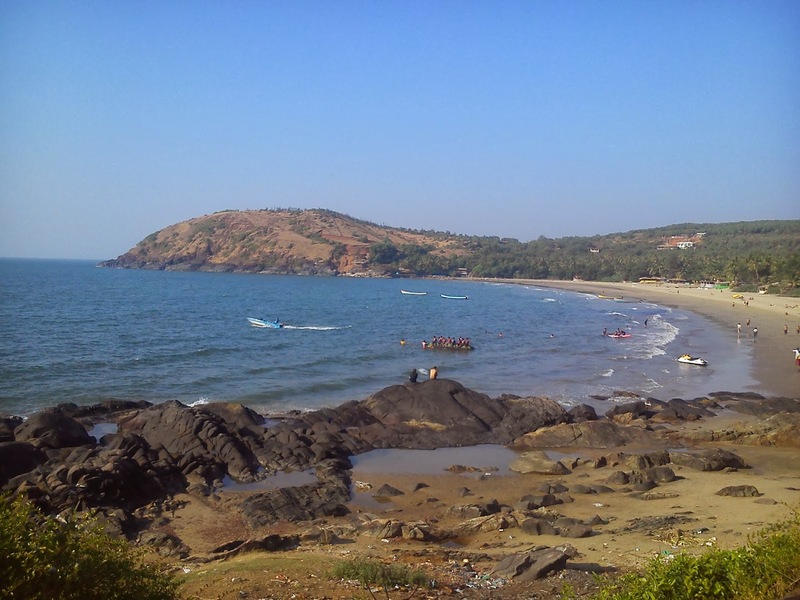 The minimum auto fare is Rs 100 to go anywhere in Gokarna. They start with Rs 200 but you can negotiate. We reached Kudle beach and started looking for rooms. This is where we did our first blunder of the trip. We took the first available room at the beach. It costed us Rs 1500/room. The room was decent and had an attached bathroom. 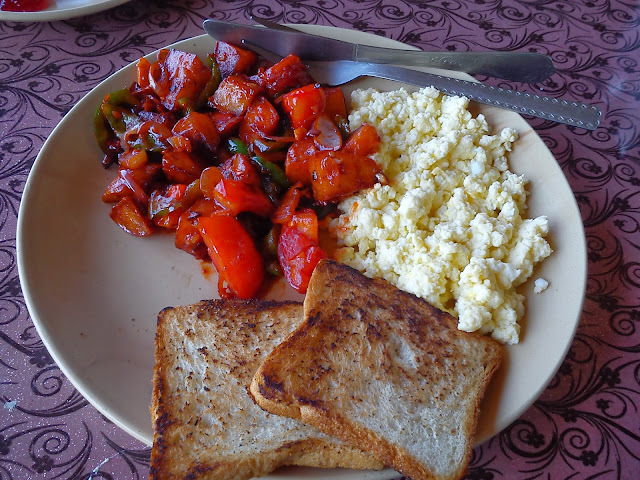 We had our breakfast at Parvathi Cafe. Decided to have a English breakfast with toast, scrambled eggs and potato. After speaking with this cafe owner Bhim, we realized that good rooms were available for Rs 800 there. (You can contact Bhim at 9535459467 for booking at Parvathi Cafe). You will get normal cottages made of wood/coconut branches for as low as Rs 400 if you are willing to go for rooms with no attached bathroom. We then went to a nice swim at the beach. This beach is so still. You ll find very less waves and it is also shallow, so you can go till around 50mts into the beach. After spending almost 2hrs in water and a walk across the stretch of the beach, we freshened up and decided to have lunch at a different place. We went to the Sunset Cafe. The food was not that good and was expensive compared to Parvathi Cafe. You have some water sports here like scooter boat and banana ride. Om beach, half moon beach and paradise beach are the 3 other beaches in Gokarna. You can take a boat to these beaches. The boat guys ask you for Rs 500/person but if you are a big group, you can go for Rs 250/person. Alternatively you can trek to these beaches. We decided to walk to the Om beach. The beach looks good from the top. You can also see the OM of Om beach if you decide to trek. The sun and humidity made us tired. 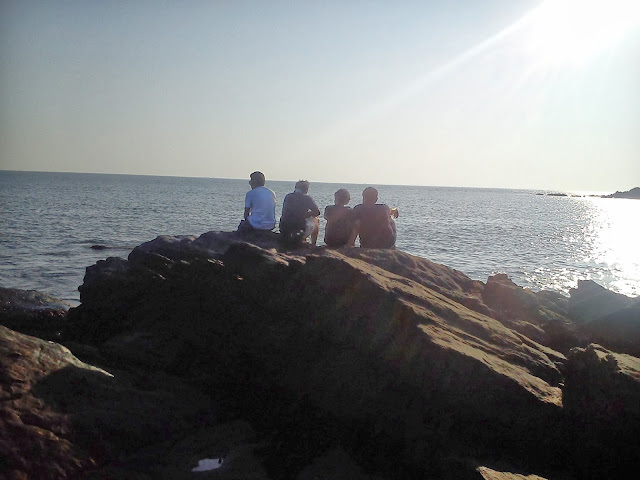 We decided to sit there and enjoy the view for sometime before we head back to Kudle. We saw the sky change its colour as the sun set and also the water reflecting the same as we spent rest of the evening playing in water. We went back to Parvathi Cafe for dinner and sat by the beach till midnight. With that we ended an awesome day at Gokarna. We reached Madgaon station at 1:20pm. We inquired for a 2 wheeler but a splendor plus bike was available for rent for Rs 700/day (The same was available for Rs 300/day when we went there couple of months back). 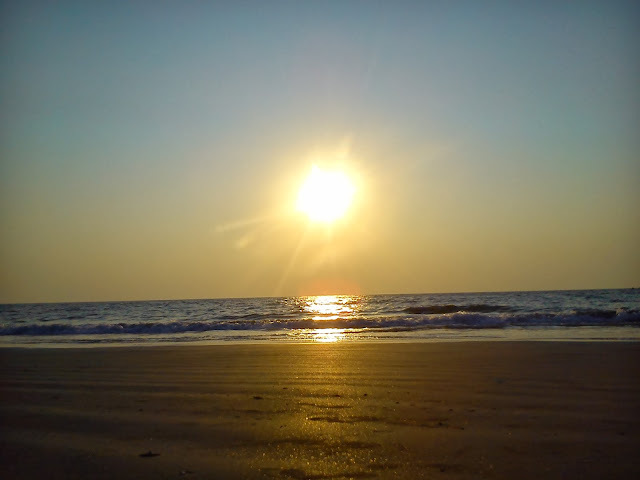 Since we had a train to catch again the next morning we took a bus to Colva beach. Again no accommodation was booked. We had our lunch at a nearby shack and walked down the road to search for rooms. We got a room for Rs 150/person. It was way cheaper considering that we paid Rs 600/person in Gokarna. We dumped our bags and headed out to the beach. 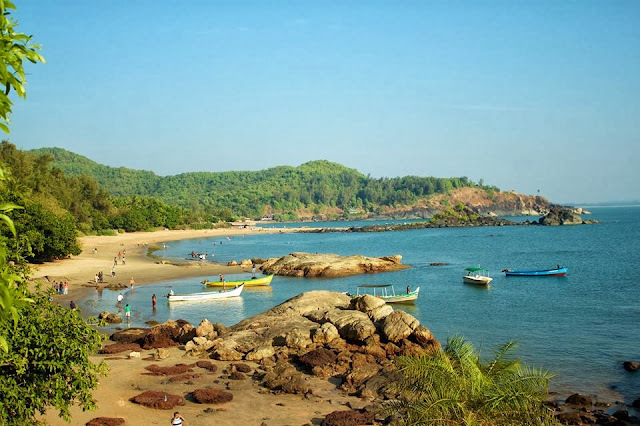 This beach is in south Goa and is so different from the beaches like Baga or Arambol that we visited last time (A well deserved break!!). 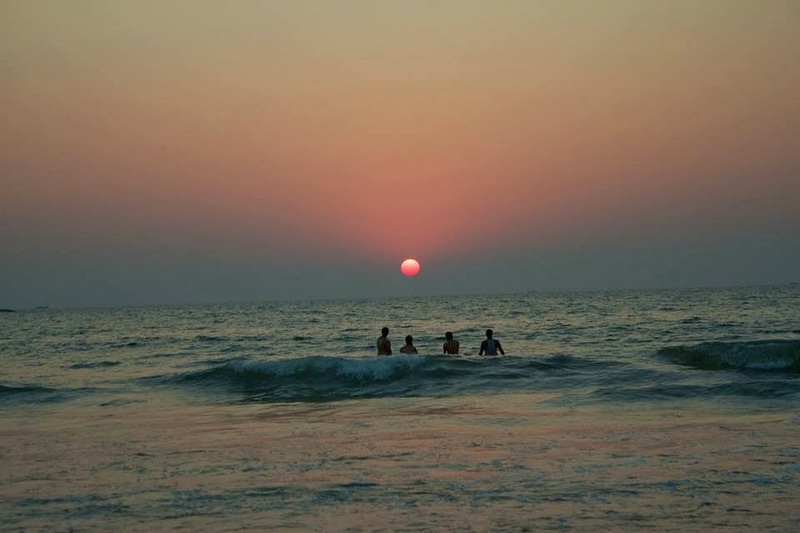 Colva beach was crowded with families and kids on school trip. So if you are visiting this beach then keep your expectations low (Yes, you know what i am talking about). We walked some 200mts and reached the deserted place and relaxed for the afternoon. 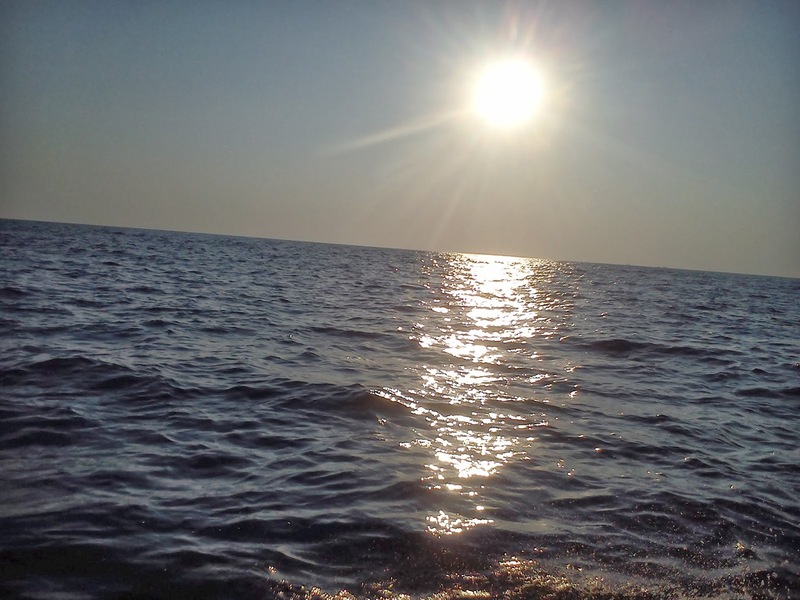 We played in water till sunset. The sad part is that there is a designated play area and it was crowded. There are lot of options when it comes to choice of restaurants here so pick your cuisine and eat away :D We then freshened up, had dinner and sat by the beach till about midnight. With that we ended our trip to the beaches. 1) Drinks in Goa are sold at half the MRP so if you are a drinker, you are at the right place.